"Hilder’s is the romance of colour, and for him the eye is sole and final arbiter. His method was one of elimination. Like Cotman, [British watercolourist John Sell Cotman 1782-1842] he added nothing to nature, but he subtracted much ... within the limits of a few square inches of paper he is a master, commanding his vision with ease and delicacy, and, with a rare and individual mind, stating that vision in terms of originality and beauty". Signed and dated l.r., blue/grey watercolour, "J.J.HILDER/ 1911". Douglas Dundas., The Etruscan , 'The watercolours of J.J. Hilder', Sydney, Sep 1959, 19 (colour illus.). Anne Gray, Sydney Long: the spirit of the land , 'The mysterious Mr Long', pg. 15-41, Canberra, 2012, 21 (colour illus.). 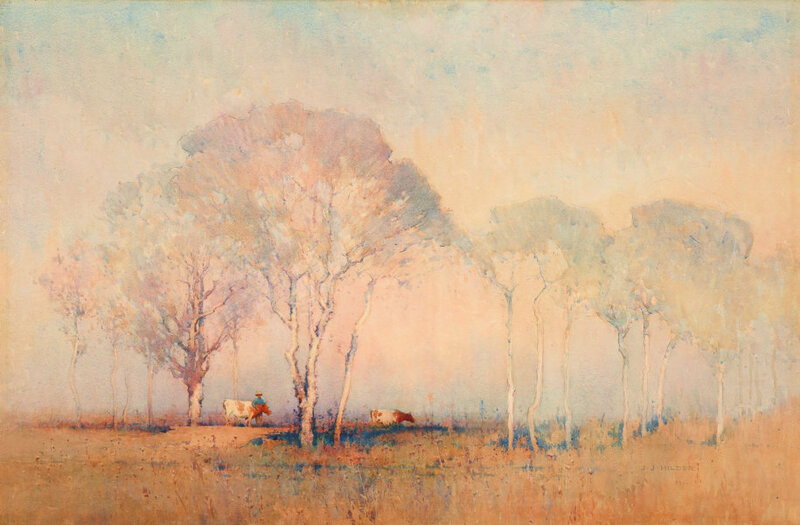 Barry Pearce, Parallel visions: works from the Australian collection , 'Introduction: Convergent Spirits', pg. 10-19, Sydney, 2002, 15, 77 (colour illus. ), 144, 147. Michael Preston, Arts Club , '"Early impressions have a 'helluvalot' to answer for"', pg. 23-25, London, Autumn 2001, 24 (illus.). Daniel Thomas, Creating Australia: 200 years of art 1788-1988 , 'Twentieth Century Art: Nature', pg.132, Melbourne, 1988, 132, 134 (colour illus.). Art Gallery of New South Wales picturebook , Sydney, 1972, 92 (colour illus.). AGNSW Collections , 'From Colonialism to late Modernism', pg. 7-106, Sydney, 1994, 22, 23 (colour illus.). In our own image: the story of Australian art , Sydney, 1995, 74 (colour illus.). Our country: Australian Federation landscape 1900-1914 , 'Introduction', pg. 16-22, Adelaide, 2001, 20, 21 (colour illus. ), 154. In our own image: the story of Australian art , Sydney, 2002, 61 (colour illus. ).